Dogs are wonderful, loving animals who don't care about superficial things like appearances... which is a very good thing because these pets are downright fugly! 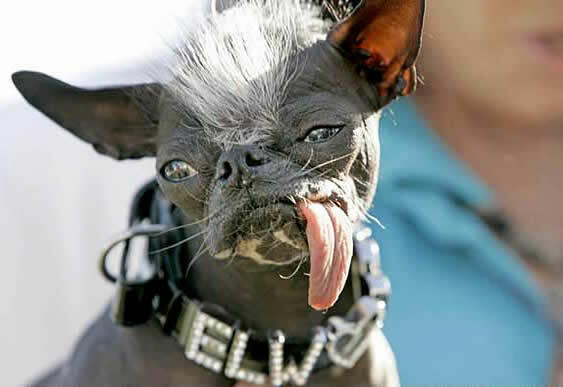 He looked like a cross between the Crypt-Keeper and a Gremlin, which made registered Chinese Crested dog Sam a shoo-in to win the "World's Ugliest Dog" competition at the Sonoma-Marin Fair in California in 2005. That was the third year in a row that Sam had won this dubious title. Sadly, the 14-year-old Sam suffered from a myriad of health problems. He died of cancer in November of 2005. Munchkin is perhaps one of the most decorated ugly dogs in recent history, having won several competitions for Ugly Dogs/Mutts and been featured on television and print media outlets all over the world. 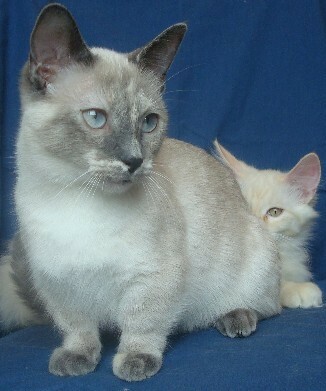 Her breed is completely indeterminable; her vet calls her a "Canardly," as in "Can hardly tell [what she is]." Munchkin snorts when she walks (waddles?) and has wiry gray hair around her neck that sticks out on its own without the use of any combing or hair products. With a face that only a mother could love, this 2 year-old half-blind Pointer mix was abandoned in an animal shelter in England before finally getting lucky. When he was named Britain's Ugliest Dog in 2010, suddenly hundreds of people flooded the Mayflower Animal Shelter with inquiries about adopting him. The lucky adoptive "parent" was April Parker, a 35 year-old mother of two. Upon adopting him, Parker's first order of business was to change his name from "Ug" to a slightly kinder moniker: "Doug." 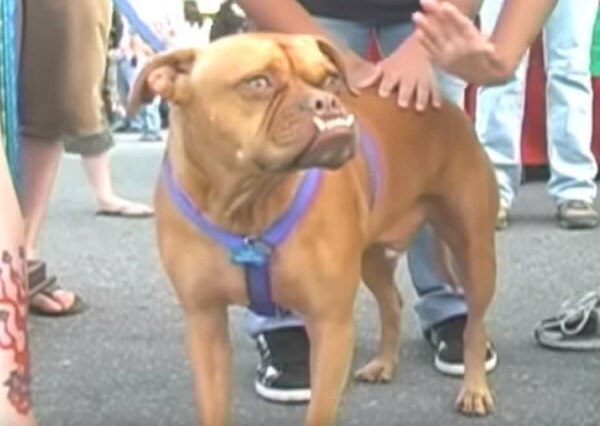 This Southern Belle won first prize at the World's Ugliest Dog competition at the Sonoma-Marin fair in 2009 at the age of 17. A Chinese Crested dog who was adopted when she was about seven, Miss Ellie's looks earned her worldwide media attention. Miss Ellie was entered to compete again in the 2010 competition but sadly, fate had other plans. She died last November at her home in Tennessee. 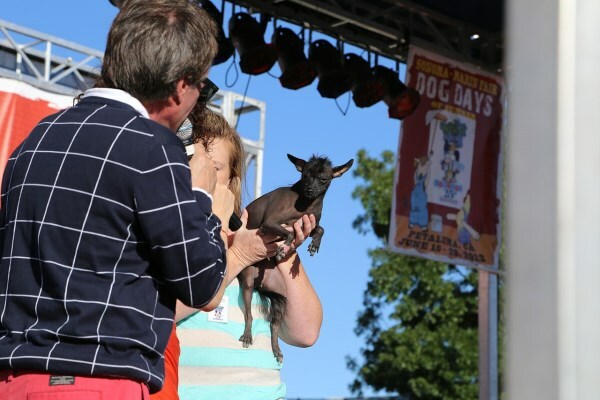 2007's World's Ugliest Dog competition introduced us to Elwood, a 2 year-old Chinese Crested/Chihuahua mix who won the blue ribbon that year. Elwood's owners were thrilled to win the competition (and the $1,000 prize money), especially because Elwood's breeder had planned to euthanize him when he was born because she deemed him "too ugly to sell." 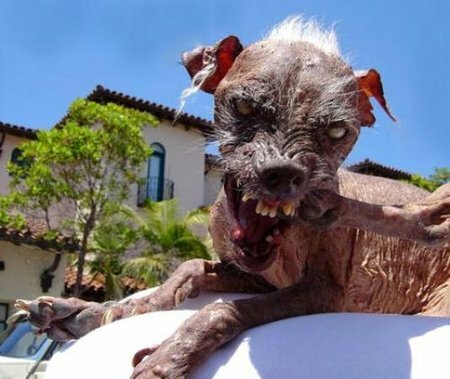 Poor Hubble had no home when he won the title of Britain's Ugliest Dog. He was living in a shelter in Leeds, U.K. after being found stranded in the woods. He was estimated to be about eight years old when he beat out the competition thanks to his mouthful of rotting, twisted teeth and mangy, pseudo-Terrier coat. Rascal comes from a long line of ugly dogs: his mother, grandmother, and grandfather have all won Ugly Dog competitions. 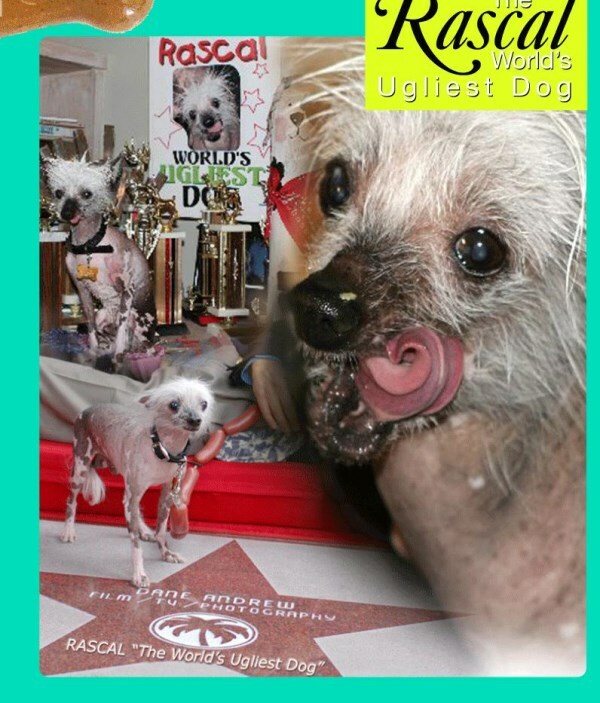 In fact, Rascal's grandfather "Chi-Chi" is in the Guinness Book of World Records for winning the most ugly dog competitions of all time. Naturally hairless and covered with spots and warts, Rascal is a purebred Chinese Crested dog. Gus had only three legs, one eye, and was riddled with cancer, but that didn't stop him from winning the 2008 title of World's Ugliest Dog. This 9 year-old pedigreed Chinese Crested dog had been rescued from an abusive home before losing a leg to skin cancer and his left eye in a brawl with a cat. 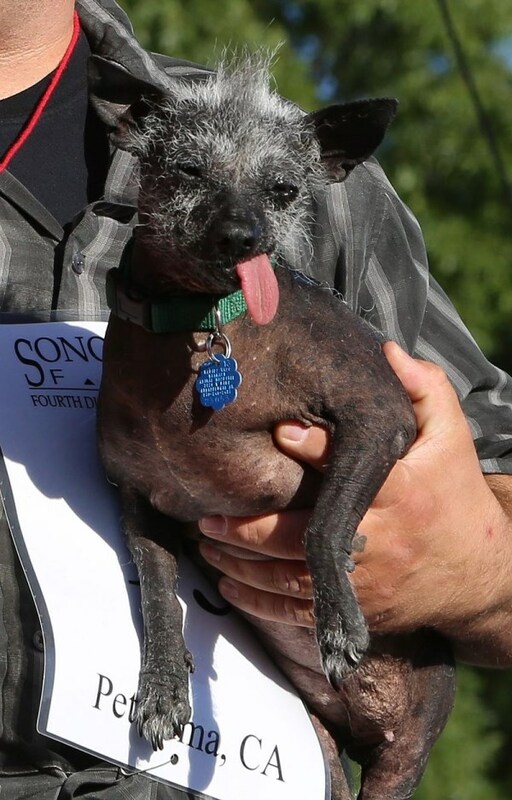 Poor Gus didn't live long enough to truly enjoy his reign as World's Ugliest Dog, however. He died just five months after winning the competition. Pabst here is one of the few dogs who was able to beat out all of those scrawny Chinese Cresteds as the overall champion at the 2009 World's Ugliest Dog competition in California. In fact, he even beat Miss Ellie! A boxer mix who was four years-old when he won the prize, Pabst was named after a cheap brand of beer due to what his owner calls his, "bitter beer face." Princess Abby, a Chihuahua with oddly-twisted hind legs, a curved spine, and a perpetually-squinting left eye, is the most recent (2010) winner of the World's Ugliest Dog competition in northern California. Princess Abby's owner had rescued the 4 year-old dog from the Humane Society after the dog had been discovered abandoned and infested with fleas and ticks. 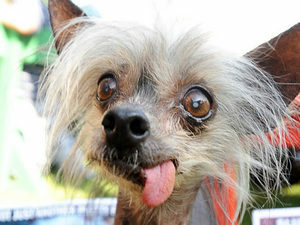 Think you've got the next World's Ugliest Dog? The annual Sonoma-Marin fair will be held June 22nd - 26th 2011. Click here for information on how to enter your dog!